Our strategic IP review process is used to guide clients into ‘world’s best practice’ in their approach to intellectual property. This enables the company to save costs, avoid risk and perhaps more importantly take up opportunities which would otherwise be missed. Increase the number of commercially viable offers resulting from R&D activities by using patent and IP strategy reviews as a way to guide the R&D activities in areas that show high market need while in the same time educating the department around documentation keeping and other. Align the IP portfolio of the company to its business goals to reinforce your competitive advantage. This directly impacts revenue and may also be used to increase your bargaining power, ward off infringers, create good will and so on. Create a series of robust internal policies and procedures in relation to such things as third party infringements, freedom to operate, litigation preparedness, negotiations, employee IP, and so on. 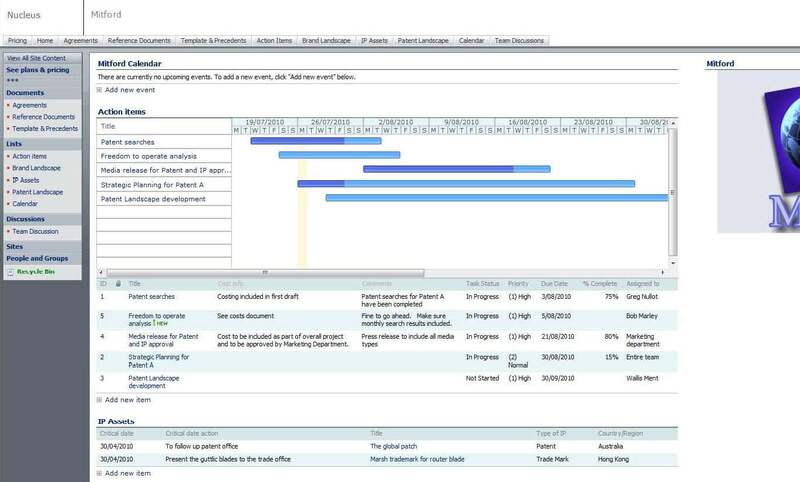 The picture above shows a Gantt chart for IP action points which arose from the strategic review process. It also shows links on the left to other areas for management of your IP portfolio, agreements, freedom to operate, etc. The Gantt chart and online action list approach means that you can easily evolve the list over time to modify and remove old issues and add and manage new issues as they arise. It also makes collaboration by relevant people much easier.